Christmas trees!! 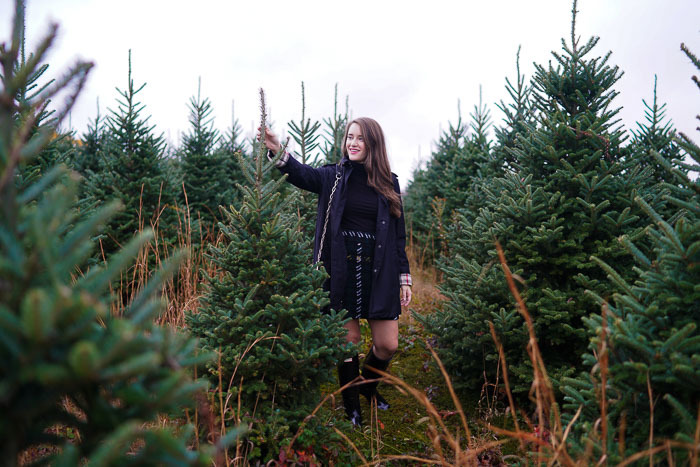 In all honesty, we didn't actually go Christmas tree picking seeing as how I 1. live in a studio apartment 2. am home for the holidays and 3. have a mini tree already. 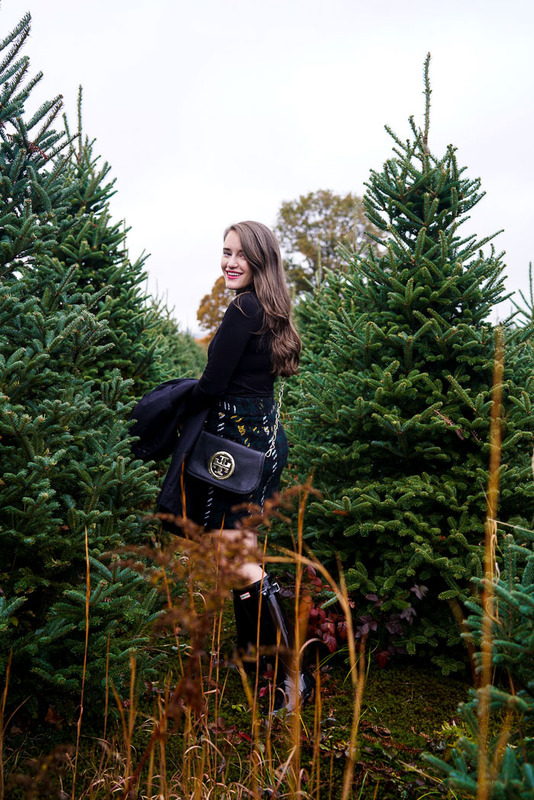 But who doesn't love to prance around a fir farm? Judge me if needed, it was too good to pass up! 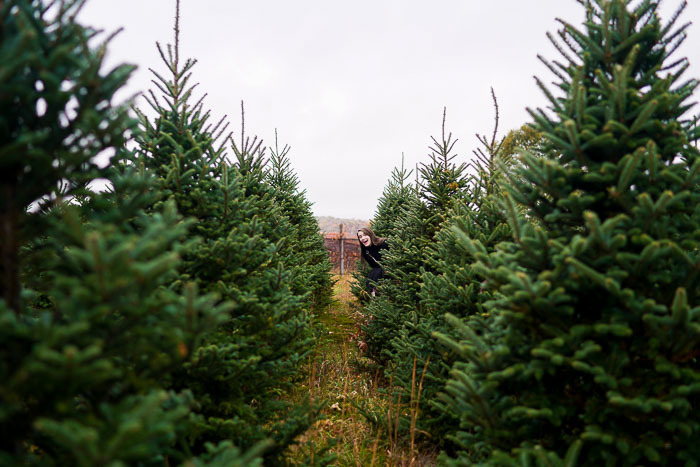 You can't tell me that it's not fun to play hide and go seek in a field full of Christmas trees. Because then you'd be lying. This got me so in the mood for the holidays I can't help it. You might remember I last wore this skirt here with a white sweater and this skirt in red here with some hunter boots. What can I say... I like these skirts! I'm also excited the week is coming to an end but boy oh boy do I have a jam-packed Saturday for you guys. You're really not going to want to miss this weekend into Monday with me. Newsletter subscribers will get a first glance into a major project I've been working on AND anyone following me on snapchat (@kristalinn14) will get a sneak peek Saturday as well. It's going to be really really good guys. Be sure to sign up for my newsletter here so you don't miss out! EEKK!! PS - My beloved mini monogram necklace (the one that I've worn everyday for three years) is ON SALE right now for 30% off [code: GETPERSONAL] as well as a ton of other personalized pieces! This is so huge and especially great for the holidays. Order now so it can be here in time for Christmas! I LOVE your newsletters! I look forward to them every week and can't wait for Saturday! Also so envious of your chilly weather and being able to embrace fall. Love the skirt! In this color and in red! Hi Krista! I've been wanting the mini monogram for a while now so I'm happy it's on sale! What chain length do you have? I can’t wait to get our Christmas tree! The house always smells amazing! 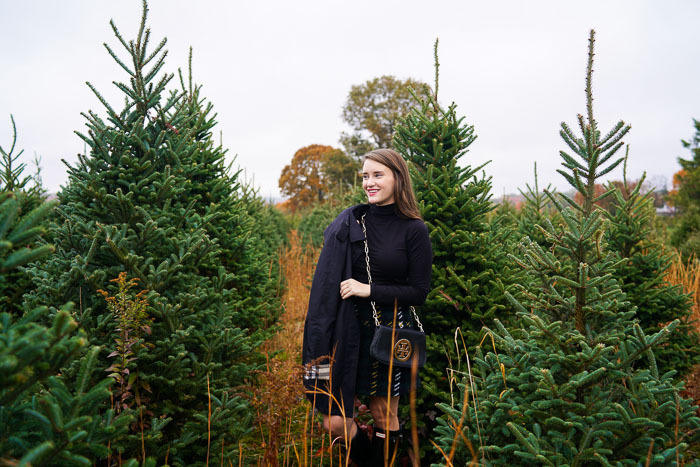 I've never been to a Christmas tree farm, but in DC the farmers come to Eastern Market and line their freshly cut trees up. It's so fun searching for the perfect one and marveling at the enormous ones that would take up the entirety of my living room!